Knowing how to use a letter of credit is an important part of international trade as it’s a very versatile instrument and when used correctly, a very import method of payment to have in your trade finance arsenal. A letter of credit definition: under a letter of credit the issuing bank guarantees the seller will receive payment on time and for the correct amount. Should the buyer, for any reason, be unable to make payment on the purchase contract, the bank is responsible for the payment. In addition to this, a letter of credit can allow the seller to receive funds before the goods are delivered, which can be advantageous if capital is needed up front. Firstly, lets start with the four most common types of letter of credit and when to use them. IRREVOCABLE: An irrevocable letter of credit, once it’s born, cannot be changed or amended without the consent of both the buyer and the seller. 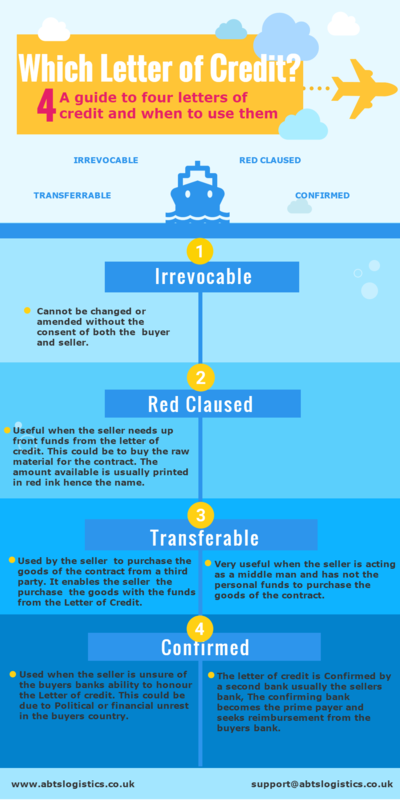 RED CLAUSED: This clause is very useful when the seller needs to raise funds from the letter of credit, for example to buy raw material for a building contract. The amount available is usually printed on the letter of credit in red ink, hence the name “red claused”. TRANSFERABLE: This can used by the seller to purchase goods needed to fulfill the contract from a third party. For example, steel, concrete and brinks to complete a building contract. This is extremely useful when the seller may not have available funds to purchase the goods to complete the contract, so could use this method to raise those funds by guaranteeing payment to the third party supplier. CONFIRMED LETTER: This is used when the seller is unsure of the buyers’ bank’s ability to honour the letter of credit perhaps due to political or financial unrest in the buyers country. The letter of credit is confirmed by a second bank which usually the sellers bank. The confirming bank becomes the prime payer and seeks reimbursement from the buyers bank. This is a little complicated but will be made clear as we dive into the detail. A Letter Of Credit, Make Money Without Money? A transferable letter of credit enables the seller (or beneficiary) to buy products to fulfill the sales contract from a third party without using their own funds, instead using the funds from the contract itself. Think of it as an advance on the payment that will be received on completion of the contract. Once this “mother” letter of credit has been born, it can be split up and transferred to as many parties as needed as long as the total does not exceed the amount of the original “mother” credit. Transferable letters of credit are often successfully used to purchase high value goods without having to dip into company funds where cash flow may be tight and the company may not be sitting on bundles of cash and need to receive payment before delivery of the goods or project. Be warned however, they are not as simple to obtain and use as some would like you to believe. It certainly should not be a way to make money, without money. A Letter Of Credit Should Always Be Used? The buyer may not want to give you a transferable letter of credit as they can be very expensive to establish. As we all know, banks seldom do anything for free and establishing a commercial letter of credit is no different. The bank will charge the buyer a letter of credit cost for this service, something that the buyer may not be willing to pay. This could be where your negotiating techniques will come in very handy in convincing your buyer that this is the best course of action. If you are not familiar with a bank letter of credit and do not have a good track record of trading under a letter of credit, you can make costly mistakes. Make sure you know what you’re doing. There could be a lot of money at stake and you you certainly don’t want to chance it. Some third party suppliers take a lot of persuading to release their goods against a transferable letter of credit, especially when they have no previous experience of trading under such a credit. It could take some time and reassurance explaining why a transferable letter of credit is a guaranteed payment and trust between you will have to be established. You may have to do a lot of “hand holding” with your third party supplier and allow them gain their confidence in you and your ability to successfully negotiate the original “mother” credit and ensure that their “child” credit is a guaranteed payment. One way to establish confidence is by explaining once the contract is delivered, it is the bank themselves that will pay out all the “child” credits to the debtor, so there is no need to chase any payments. You must be confident in your own ability to utilise a transferable letter of credit which really only comes about from hands on experience and training. There is one other type of letter of credit which is not actually meant to be used, which is known as a standby letter of credit. This is a last resort or safety net for the seller reducing the financial risk within the contract. It’s basically a guarantee of the payment from the issuing bank on the behalf of the seller. If the buyers business for some reason was to declare bankruptcy or was just unable to make the payment, this would make the bank pay but the intention is that it will never need to be used.A standby letter of credit is usually issues in good faith providing proof that the buyer’s credit is in good standing and that they will be able to make the payment without any issues. Standby letters of credit are usually issued in good faith providing proof that the buyer’s credit is in good standing and that they will be able to make the payment without any issues. The buyers company will undergo a credit check before the bank issues a standby letter of credit giving security that the company is stable and not under any financial trouble. What’s The Difference Between A Standby Letter Of Credit And A Letter of Credit? A Standby Letter of Credit is different from a Letter of Credit in that a standby letter of credit is paid once the conditions of the contract have not been met by the buyer and payment has not been received by the seller. A Letter of Credit is a guarantee of payment when specific conditions are met and documents received from the seller. Something else to be aware of is that there have been a set of rules created and agreed by the International Chamber of Commerce, known as the Uniform Customs and Practice for Documentary Credits (commonly called “UCP”), which banks and financial institutions that issue letters of credit are subject to. The regulation was put in place in order to standardise international trade finance and reduce the financial risks associated with trading goods and services and govern international trade. UCP 600 is currently in the 6th revision which is where the “600” comes from. We won’t go into any further detail on this as it’s a subject on its own but for now, it’s something to to know. Using a real world example, we can hopefully show you more clearly the letter of credit process and just how does a letter of credit work. Not so long ago we were asked to work with a small London based building company who had been awarded a nicely sized contract to build a brand new, modern sports facility in the United Arab Emirates. The high end sports facility would include a swimming pool, saunas in the changing rooms, two basketball courts, a full size gym with aerobic equipment as well as a lounge area complete with table tennis and pool tables and health bar. As you can imagine, this type of facility doesn’t come cheap and the contract value was negotiated and agreed at just over £1.6 million (GBP). This included the raw materials, exporting of the required materials that could not be sourced within the UAE and the construction of the facility. As you can probably imagine, most businesses don’t have £1.6m sitting in their company bank account so raising the funds to complete the project was something that needed to be handled. This company took the traditional avenue and approached their bank for finance but for one reason or another weren’t granted the entire amount. They subsequently approached other finance companies who offered them funds but the terms of repayment weren’t suitable. At this point, the project looked to be in jeopardy and the contract had to be reconsidered. On contacting ABTS Training, we suggested that they ask their client in the UAE for a transferable letter of credit from their bank. What this meant was that the client approach their bank and ask them to issue a transferable letter of credit for the value of £1.6 million, which is passed to the UK building company. This assures that funds are available and that the payment will be made if the correct documents are presented by the UK company, such as invoices, bills of lading, packing list and others. The bank is guaranteeing the money and becomes responsible for the payment. Negotiation skills need to be on point with this as, as mentioned before, there is a cost to the client in the UAE to issue this transferable letter of credit. As this is a real-word example, lets break down what was actually included in this letter of credit and the inner workings of it. This particular letter of credit was issued from the clients bank in the UAE via a bank located in the UK, so it was this UK bank that was ultimately responsible for paying out the £1.6m. This UK bank was unknown to the building company in the sense, they had no relationship with the bank, so in order to minimise their risk, they asked their bank, Natwest to “confirm” the letter of credit. What this means is, Natwest confirms the letter of credit exists (taking away the risk of any fraud, which unfortunately does happen) and that they (Natwest) will honour it on the presentation of all the relevant and correct documents. As you may have guessed, Natwest do not do this for free and charge our building company a fee for this service but it’s a fee that gives our building company peace of mind. A transferable letter is a letter of credit that simply means the building company can “break up” the letter of credit and use it to pay who they need to pay, for example, steel suppliers. As mentioned earlier, a transferable letter of credit can be broken up from one “mother” credit, into “child” credits and distributed as long as the combined value does not exceed the mother letter of credit. As mentioned above, a “red clause” allows a stated percentage of the value of the credit to be received by the building company, effectively in cash and be used for immediate expenses, such as paying staff during the building period. In this case of the UK builder requested a 5% red clause and used this money for up front costs such as architects fees and plans, staff costs and engineer’s site visits. Letters of credit and bank guarantees are similar in function in that they give confidence to the parties involved and reduce financial risk. However, we have to dig a little deeper to see the difference. A letter of credit ensures that the seller will be paid eliminating the risk that the buyer will not pay at once the contract has been fulfilled, ensuring that the contract can proceed. A letter of credit is proof that the bank is happy with the buyers credit score instilling more confidence. A bank guarantee is usually taken by both parties in a transaction helping to reduce the risk of both sides. If one side cannot pay after the agreed terms have been met, they can trigger the bank guarantee. It’s generally used as a way for both parties to show they are both financially stable and their credit is in good standing. Letters of credit are used within international trade whereas bank guarantees are more often used in real estate and infrastructure contracts of a high value particularly in the United States. 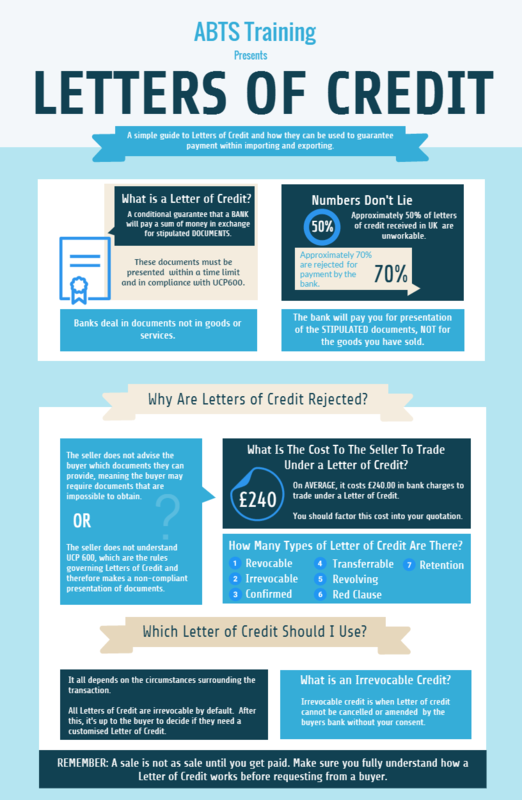 Almost half of letters of credit received in the UK are unworkable according to some research, the buyer requests documents which the seller is unable to produce, so be aware and be proactive, not reactive. As you can see, letters of credit are a great way to fulfill projects when cash is tight but it’s really important to know what you’re doing as they can be complicated. If you get it wrong, you could be left holding the can and unfortunately there are many horror stories of contracts going desperately wrong due to people not understanding how to properly establish and use letters of credit. Don’t be one of them! Check out our online course which streamlines the aspects of import and export, including letters of credit, for just £149 (approx: 14,000 INR | 71,500 NGN | 3,455 EGP | 1,060 TRY | 275 LYD).